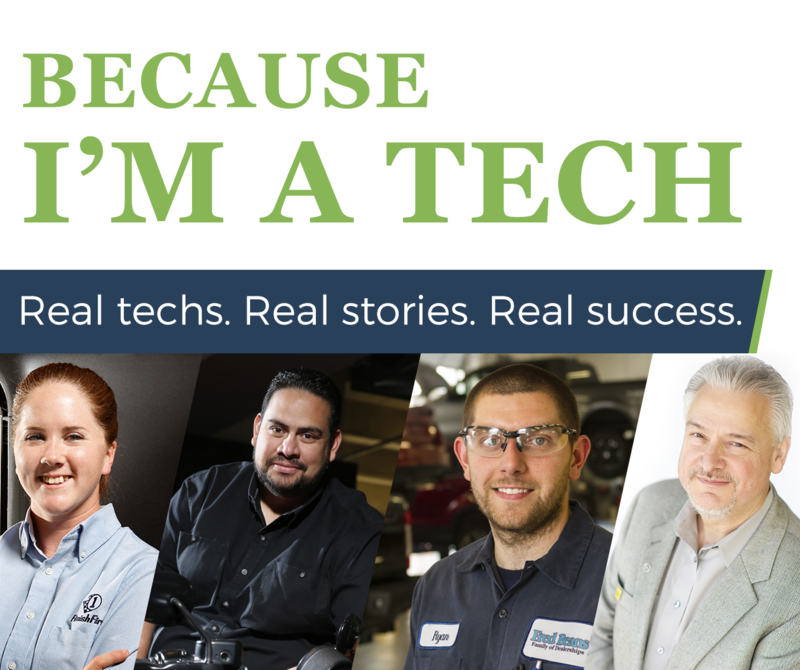 SCOTTSDALE, Ariz., August 27, 2018 – TechForce Foundation, a non-profit organization focused on championing students to and through their technical education and into careers as professional transportation technicians, has launched its Because I’m a Tech campaign (hashtag #becauseimatech) to coincide with Labor Day. The campaign is designed to educate teens and parents that there’s more than one road to success, that a technical education and career is a viable pathway to a rewarding future and about the attractive opportunities of being a professional technician in America’s robust transportation industry. Labor Day has long been celebrated as a day dedicated to the social and economic achievements of American workers. However, over the years, its true meaning has taken a backseat to rituals of shopping, backyard barbecues and, for many, simply celebrating the end of summer and preparing for a new school year. While this trend can be seen as symbolic of the distracted times we live in, TechForce sees it as an opportunity to re-engage and re-activate a growing segment of Americans who’ve become weary and afraid of the changing workforce landscape as technologies such as automation and artificial intelligence become more prevalent. Simultaneously, people are seeing the skyrocketing costs of four-year universities and financial aid turning higher education into a less viable option for long-term financial success and stability. Today's transportation techs are well-paid, highly skilled, hands-on problem-solvers who are not burdened by massive school debt like their four-year school counterparts. As we change the outdated image of this profession, we can get more students interested in becoming technicians. Perhaps most concerned about these trends are the segment of 35-50-year-old women and men – mothers and fathers who are faced with the challenges of shaping and supporting the career aspirations of their teenage sons and daughters who are on the verge of making decisions that will heavily impact their own social and economic futures. ● let them see firsthand how real people are building rich and fulfilling lives BECAUSE THEY ARE TECHS. Videos at futuretechsuccess.org. ● demonstrate exactly where and how to start one’s own journey down this promising path by providing an actual “roadmap” to success. Downloadable maps at futuretechsuccess.org/map. The obsolete view of yesterday’s transportation careers had typecast them as low-tech “blue collar” jobs. The reality is the mechanic has been replaced by a highly trained technician, and the profession has evolved to high-tech, “new collar” careers where smart and talented individuals can find economic stability and personal fulfillment. Well-intended educators and their incentives have done a disservice to our future workforce by positioning a four-year degree as the only road to a successful career (hashtag #morethanone). For some, technical schools are a better path and better aligned with their tactile (hands-on) knack for problem-solving. Financial feasibility is also a significant factor in the current environment of skyrocketing college loan debt. Tech school graduates have considerably less educational debt and pay it off faster than their four-year counterparts. Technicians consistently report that they find their work much more fulfilling than they would if they were stuck at a traditional desk job. The days of the “grease monkey” are long gone. Today’s vehicles have millions more lines of code than the spaceship that put man on the moon. Transportation techs are computer savvy and in demand. One out of every seven jobs in the U.S. is transportation-related and there is a massive shortage of qualified technicians, which means hiring demand is sky-high. Recent Bureau of Labor Statistics data shows the annual demand for new tech graduates is more than double the number that are graduating – essentially more than two new job openings to every one tech graduate. TechForce Foundation is a nonprofit, 501(c)(3) with the mission to champion students to and through their technical education and into careers as professional auto, diesel, collision repair, motorcycle, motorsports, watercraft, welding and aviation technicians. The foundation distributes more than $2 million in scholarships and grants annually, thanks to its generous corporate sponsors and donors, and is spearheading FutureTech Success®, the industry-wide initiative to help encourage and support more young people to pursue the vehicle technician profession. For more information, visit www.techforcefoundation.org. Photo and infographic available here.